At Slicktext.com, we encourage all SMS marketing users to take advantage of our awesome text to win contest feature. It’s a great way to quickly grow your list, and provides current subscribers with a reward for their loyalty. When developing an incentive for your contest, be sure to offer something that provides instant appeal. You want to immediately grab the attention of your subscribers. Don’t desperately coax them with an average prize. Let your incentive do the talking. So, let’s say you own a popular cafe, espresso bar, or all around hip establishment. First things first, you should definitely be using SMS marketing to encourage more day to day business. Instead of offering punch cards, track and reward loyal patrons with mobile coupons. Let’s fast forward, and assume you see the value in this mobile communication tactic. Ready to take your growth to the next level? Give a text to win contest a try. 1. Decide on one grand prize. The grand prize should be irresistible. For cafes, something like a year’s worth of free beverages should do the trick. You want your customers’ jaws to drop when they see the prize. 2. Next, come up with an instant reward for all non winners. Keep it simple. Reward all entrants with something valuable, like a free cup of coffee. This will easily encourage more participation. Don’t run the contest for too long. Create a sense of urgency with a limited window of entry. One to two weeks max is ideal. 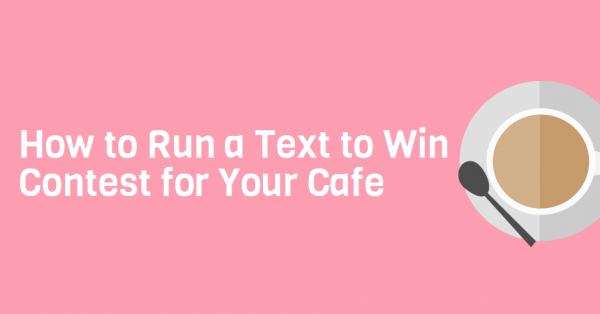 If you don’t spread the word about your text to win contest, you won’t experience maximum results. Print up in store flyers, engage patrons via word of mouth, and share contest details on social media. Ready to partner with one of the top SMS marketing providers? Give us a call at 1.800.688.6290 to sign up for your free plan. Want to Launch Your Own Text Message Program? Create your free account today. No credit card required. No catches. Learn how to boost sales & grow your business using SMS marketing. Take your SMS marketing skills to the next level with this in-depth guide. Learn how to ensure your text messaging program is compliant with laws and regulations. What Is RCS Messaging and How Does It Work? SlickText is a 100% opt-in service. We do not provide lists of phone numbers nor do we access or share our users' contact lists. To learn more about our stance on spam and data privacy, view our anti-spam and privacy policies. Standard message & data rates may apply in the US & Canada. For help, text HELP to 31996. To opt-out of any SlickText service, text STOP to 31996. © 2019 Slick Innovations, LLC. All rights reserved. Whether you have some questions, are eager to learn more, or want to take the next steps, we are here for you. Please let us know how we can help and we'll make you a priority! We'll be back in touch very shortly!